Hi everyone! My name is Angela and I’m excited to be a style contributor here at Sugar Bee Crafts. At my blog, Handmade in the Heartland, I show recipes, crafts and DIY projects, home decor ideas, lots of dessert recipes and the occasional fashion post. I’d love for you to pop over and see my blog. 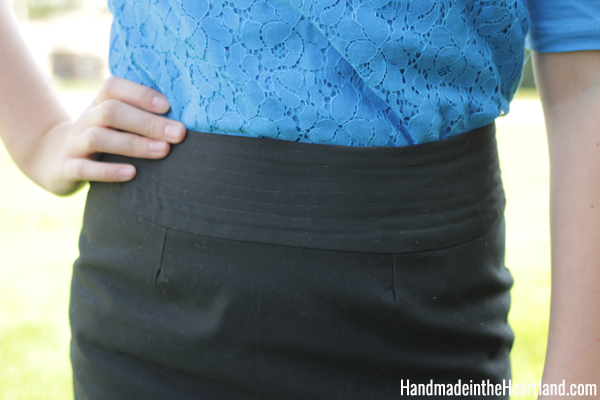 Today I’m excited to share this adorable pencil skirt with you today! As a mom of two little kids I have a few great babysitters that I rely on to watch the kiddos when the hubs and I go out or have multiple things going on at the same time. Maddie is one of those babysitters and this summer when I texted her mom to see if she could babysit for us her mom responded by asking me if I could pay her in skirts instead of money. 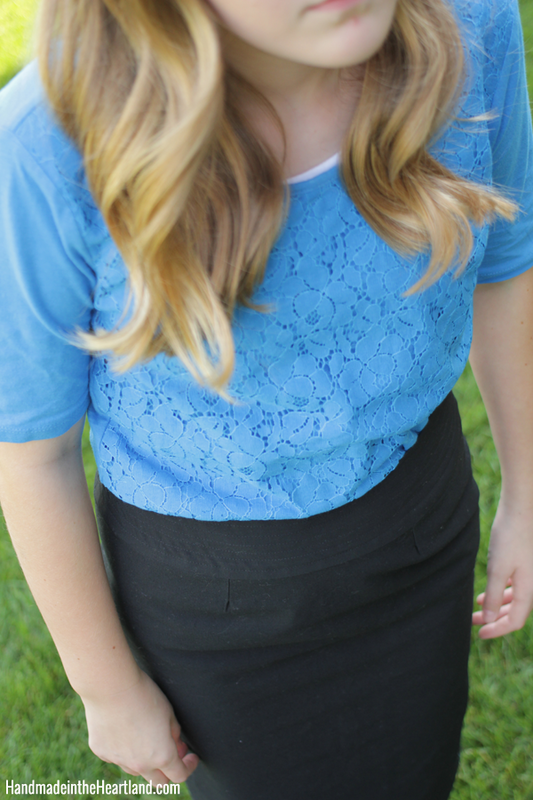 She is 13 and they were having a hard time finding knee length skirts in her size, she wears a 14 in girls, and I have to say I’ve glanced at girls clothing and to find something that is sophisticated and modest is challenging. Of course I agreed and Maddie and I together made this black pencil skirt. 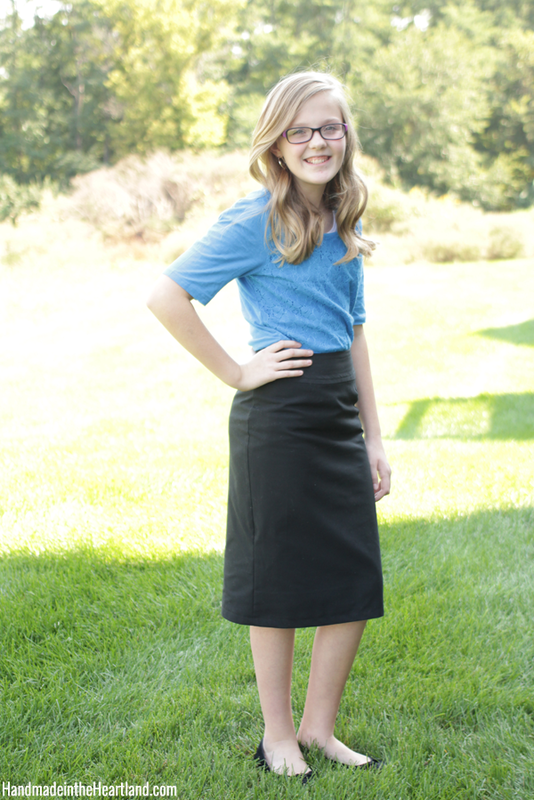 The photo below is the original picture that Maddie’s mom emailed me of what she wanted her skirt to look like. I loved the detailed waistband so we decided to carry that idea through to her final skirt. We used some black medium weight fabric we found at JoAnn’s for her skirt. 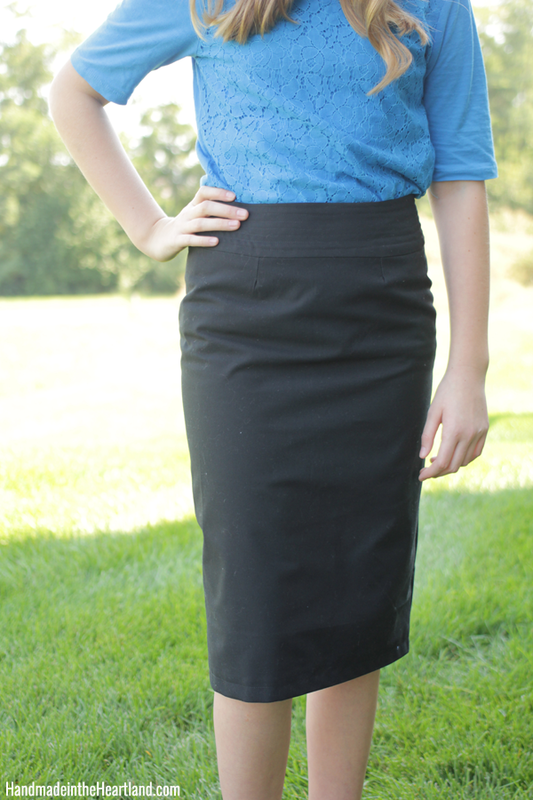 We started Maddie’s skirt by using a women’s pencil skirt pattern. Because she is 13 and her body is smaller than a size 4 woman we altered the skirt pattern a little. First we sewed up the skirt at the smallest size of the pattern, we measured Maddie’s waist and figured that the smallest size on the pattern would fit. We cut out the front and back of the skirt and sewed the side seams to see how it fit. We realized that the top of the skirt pattern without the waistband was the highest that we wanted the skirt to come on her waist. I then drafted a new 3″ waistband and then cut the top of the skirt down 2 1/2″ from the top all the way around. We cut two waistbands and interfaced the front, sewed the top of the waistbands together and then sewed the top stitching 1/4″ apart all the way around. I love how the topstitching adds a nice but subtle detail. How cute is this girl?! She totally rocks this skirt! We added 2″ to the length of the skirt pattern, don’t be afraid to add length to a pattern if you fear it might be too short. 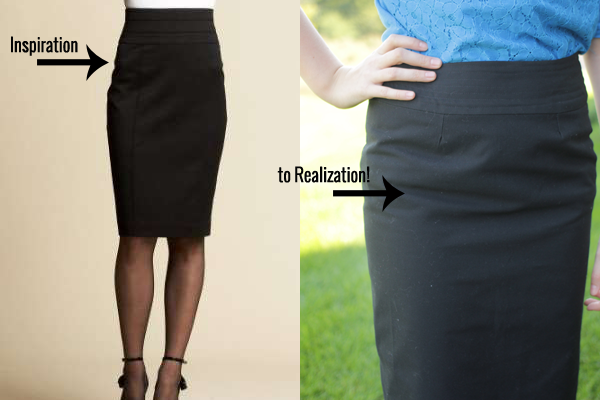 Its always better to have a thicker hem than your skirt be too short. Maddie and I are in the process of making her a navy one as well, She is only 13 but has the focus and talent of a college student- she catches on so fast! 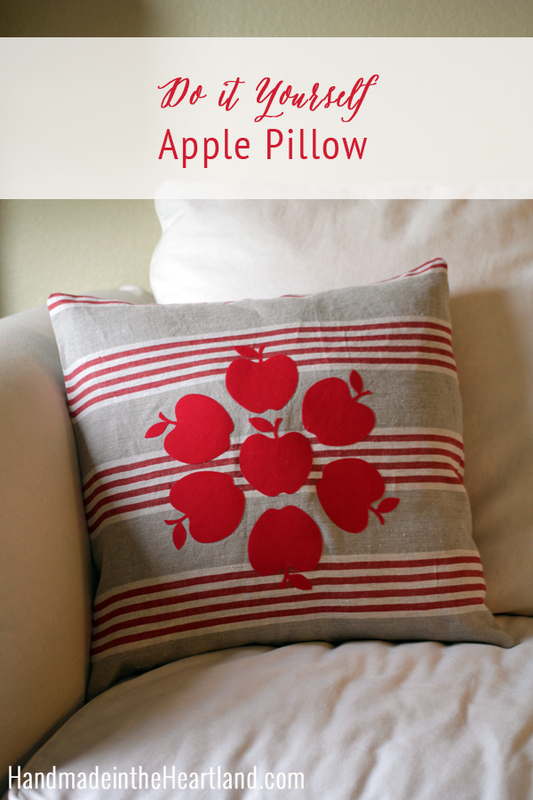 Don’t ever be afraid to teach tweens and teens new skills, especially sewing. I hope you enjoyed this post! 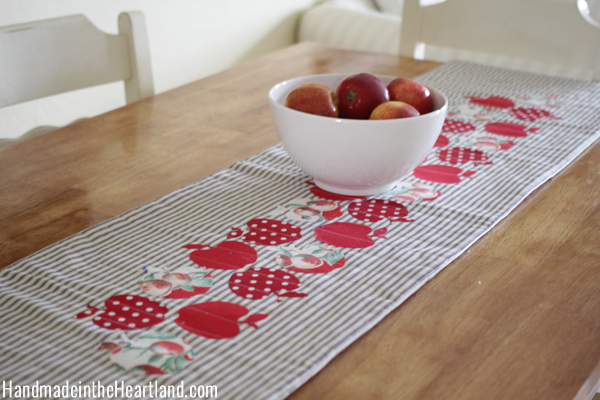 I love to sew and craft, here are a few other projects from handmade in the heartland you might like.